He waited 12 years to make this subdivision deal happen. It’s not that the deal took 12 years to negotiate or finance – the property was simply not on the market when he first spotted it. Still – as soon as he spotted it – he knew… He knew he found THE DEAL. With only $170k of his own money invested, he was able to generate a $850k profit. More on this in just a second. Nhan, How did you find the Subdivision deal? I’ve actually been working on this deal for 12 years. The home belonged to my cousin and it took me twelve years to convince him to sell it. He knew he wanted to sell it one day but I had to wait until the time was right for him. The important thing to remember here is to have patience when it comes to negotiating deals. Based on the profit I received from the deal, a 12-year wait didn’t at all render the deal unprofitable. On the contrary, I grossed an average of $75,000 a year profit, and for eleven of the twelve years I did very little work on the deal. How did you secure the deal? I started out by offering the seller 1 million dollars for the property. He wasn’t thrilled about that price so we negotiated from there. As a property investor, it’s important for you to work at making the offer attractive to the seller yet still worth your time and money from a profit standpoint. Why is getting early access to the property when doing Subdivision so important? I always work to make early access part of the settlement agreement when it comes to subdivision. This allows me to prepare the site for council approval. In this case I removed the tennis court and the trees on the lot in order to make the lot proposal more attractive to the council. As a side note, it’s important to always check for VPOs (Vegetation Protection Orders) on the land before removing any trees or shrubs. – How to buy property with no money down and have money left over! Interested? All you have to do is leave a comment below sharing your biggest takeaway from this post. The first five people to leave a comment here win a ticket to Nhan’s half-day workshop! How can securing a long settlement save me money? Along with early access, it’s important to negotiate a long settlement date on a subdivision project, as holding costs on a site can dramatically reduce your profit. In this case I asked for a 10-month settlement. Anytime you’re paying interest to borrow money as opposed to paying cash, you should work to negotiate a long settlement. This will minimise the amount of interest you pay on any bank loans. 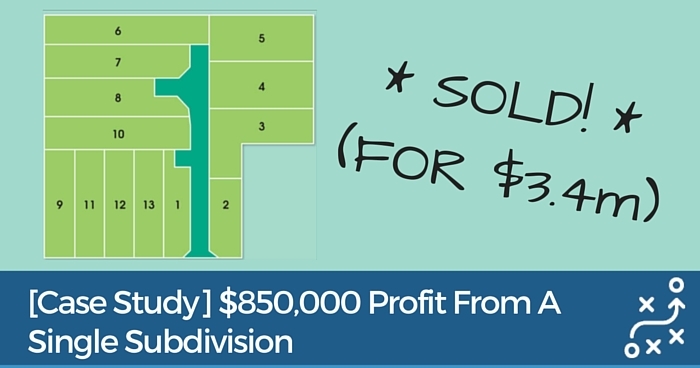 How did you know how many subdivided lots you could get on the property? By communicating with the local council, I knew the minimum lot size for the area, and knew roughly what easements were required to ensure sufficient access to each proposed lot. I used this information to draw up potential development plans before making the offer on the property. Sometimes you need to get creative with your lot boundaries. A continual balance between maximizing the site and giving the market what it wants. It’s important when considering a subdivision deal to do your due diligence before you make an offer. Know the minimum lot size required by the council. Have an idea of what types of easements and driveways will need to be added to the lot. How did you pay for the deal? I raised most of the funds from private investors and via a bank loan. My private investors contributed 700k toward the deal and I negotiated a $1.8 million loan from the bank. I also put 170k of my own money into the deal. Once the investor funds came through, I was able to pull my personal money out of the deal, freeing it up for other potential investment purposes. Part of the reason I was able to get investors to take part in the deal was that I showed them that I believed in the potential profitability of the deal. By investing my own money into the deal and by showing them on paper what the profit could be, I gave potential investors confidence in their investment. I faced several challenges along the way, which is often the case with any development. The first challenge was negotiating with the seller. Dealing with the vendor directly is almost always more profitable as you avoid real estate agent fees. However, it’s important to be prepared for potential challenges from the seller and the influence of those around them. I also faced challenges in dealing with the neighbors. One neighbor wasn’t thrilled about the idea of the subdivision. We also had two major rain events which resulted in mud into a neighbor’s pool. I spent a good share of money soothing neighbors’ objections and cleaning up the mud from the rain events. There were also challenges in dealing with council. There was an $11,000 fine for the mud incidents, and other miscellaneous fines and modifications that the council insisted on along the way. There were challenges with contractors. One contractor was understaffed, and couldn’t get the job done because he’d underestimated the staff needed to finish the job. Another contractor changed his estimate, insisting that I couldn’t get the job done at the price he originally quoted. If that happens to you, don’t be afraid to get other quotes. Find another company if you feel you’re being treated unfairly or unethically. An additional challenge came courtesy of the demolition crew we hired. Their price was low; 16k as opposed to the 40k estimates I received from other demolition companies. They were cheap, but their work was rough. In fact, there were occupational safety violations that needed to be dealt with because of the roughness of their work. The key is to get estimates from several companies for the work you need done, and to be aware of both overinflated and underinflated estimates. What are your keys to creating a successful subdivision deal? Deal directly with the owner if you can and if there’s not already a real estate agent involved. It’s often more profitable than going through an agent. Also, you want to ensure early access to the site before settlement date. This will allow you to prepare the site for council approval before you start paying holding costs. Do your due diligence before you get too far into the project. Understand that due diligence research requires risk. Sometimes you have to throw 10, 20, 30 or 50k at a deal to see if it will work. Because of this, it’s important to ask yourself “How much money am I willing to spend to test the deal?” Part of a successful due diligence plan is being willing to lose that money if the deal doesn’t work out. If you want to be successful at property investing you have to take some risks. Be sure that those risks are calculated risks. Determine how much money you’re willing to part with, and don’t risk more than you’re willing to lose. It’s cheaper to add an easement driveway than adding a street driveway. Land subdivision requires space for rubbish bin pads and for visitor parking. It’s going to cost some money to get estimates for those types of lot improvements. You need to know the competition and supply better stock. In this case, the minimum lot size requirement for the area is 400 meters. However, we built bigger 600 meter lots in order to increase profit and to produce lots that were more attractive to potential buyers. Also, know the local council rules inside and out. Bend – but don’t break – the rules. What was your profit on the deal? The purchase price total was $1.25 million. The costs to develop the lots were $1.3 million. We sold the lots for a total of roughly $3.4 million. The gross profit on the deal was approximately $850,000, and it took eight months from start to completion of the project. As shown here, subdivision and development can provide lucrative profits in real estate investing. If you have any questions or want more information regarding this type of property investing, please let us know in the comments below. Thanks for the comment Will and yes you are right, patience (combined with persistence meeting opportunity) will always win out…. 12 years is pretty committed though I must admit! We’ll send you details on how to get along to Nhan’s workshop – congratulations! Great Deal & Very good info. Lessons learnt, patience persistence & facing & resolving challenges is key to success. Thanks Matt &. Thanks Naghan for sharing this deal ! Interesting! It is written that he produced $850k profit from $170k of his own money, I’m curious if the $850k was then divided amongst the other investors and how much of the profit he recognised himself….? Hi Catherine, thanks for the comments. I had some more detailed chats with Nhan about the project and I know that initially he put his money in and once investors put their funds in, his capital was repaid which made the project a ‘no money down’ deal at the time of purchase settlement. Yes he had to distribute some interest repayments to the investors but I know that Nhan has very much ended up with the lions share of the profit. I’ve recently moved to Australia so sub-divisions are new to me. There is so much I have to learn and this case study has answered a few basic but important questions such as who to approach re: minimum lot size for the area, and to do my research on driveways etc..
To answer your question though about demand, yes there was a demand for lots however Nhan used a number of strategies to ensure all the lots were sold fast (some before he even finished the subdivision). There was also some precedent in the area of other sites being subdivided in the same fashion which always helps with council approval. You raise a good point though because it’s so important to know the end sale value of your lots and who is going to buy them. Starting with the end in mind is critical so you can work backwards from there to ensure there is potential profit. Regarding the trees, Nhan was able to gain permission from the owner to remove the trees during the settlement period so there was no need to get council approval (of course the site had no vegetation overlay so the trees were able to be removed). Having no trees when applying for the subdivision also meant less obstructions when presenting the proposed new lots. I believe this is a perfect sample for people who has done everything right in subdivision business. Really interesting to read this article.